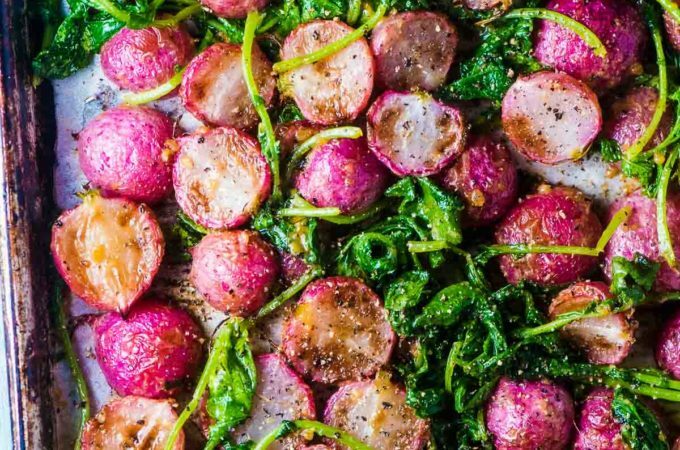 Miso Butter Roasted Radishes are the perfect side dish to welcome in spring. They make a healthy, low carb alternative to potatoes and are so pretty! Preheat your oven to 450 degrees. Line a baking sheet with parchment paper. Twist the greens off the radishes, put them in a bowl, and toss them with 1/2 teaspoon of the oil. Cut the radishes in half, put them on the baking sheet and toss them with the remaining 1 1/2 teaspoons of oil and the pepper and arrange them cut side down. Put them into the oven on the bottom shelf and roast for 12 minutes. While the radishes roast, mix the butter with the miso. Add the greens to the baking sheet and dot the miso butter on top. Roast for 3 more minutes. Remove the radishes from the oven and toss to mix the melted miso butter. Serve right away.